The Global Volcanism Program has no activity reports for Tuya Volcanic Field. The Global Volcanism Program has no Weekly Reports available for Tuya Volcanic Field. The Global Volcanism Program has no Bulletin Reports available for Tuya Volcanic Field. A broad region dotted with formerly subglacial volcanic cones known as tuyas forms the Tuya Volcanic Field near Tuya Lake and a broad area to the N. Although tuyas, the products of Pleistocene subglacial eruptions, are perhaps better known in Iceland, these predominantly flat-topped basaltic table mountains derive their name from the Tuya region in the Cassiar Mountains and Tanzilla Plateau area of northern British Columbia. Tuya Butte itself, immediately N of Tuya Lake, has no summit crater or obvious vent, suggesting fissure-fed eruptions, although several indications suggest a vent location near a large cirque on the N face. Other tuyas lie in the High Tuya Lake, Iverson Creek, Rancheria River, and Klinkit Lake areas. Several small subaerial shield volcanoes, and postglacial lapilli cones and lava flows have been reported in this area. At least one of these, Grabrielse Cone near the headwaters of Iverson Creek, is of Holocene age. Allen C C, Jercinovic M J, Allen J S B, 1982. Subglacial volcanism in north-central British Columbia and Iceland. J Geol, 90: 699-715. Gabrielse H, 1969. Geology of Jenning River map-area. Geol Surv Can Pap, 68-55: 1-37. Simpson K, Edwards B, Wetherell K, 2006. Documentation of a Holocene volcanic cone in the Tuya-Teslin volcanic field, northern British Columbia. Geol Surv Canada, Current Res, 2006-A1: 1-7. Wetherell K, Edwards B, Simpson K, 2005. Preliminary results of field mapping, petrography, and GIS spatial analysis of the West Tuyu lava field, northwestern British Columbia. Geol Surv Canada, Current Res, 2005-A2: 1-10. The Global Volcanism Program is not aware of any Holocene eruptions from Tuya Volcanic Field. If this volcano has had large eruptions (VEI >= 4) prior to 10,000 years ago, information might be found on the Tuya Volcanic Field page in the LaMEVE (Large Magnitude Explosive Volcanic Eruptions) database, a part of the Volcano Global Risk Identification and Analysis Project (VOGRIPA). There is no Deformation History data available for Tuya Volcanic Field. There is no Emissions History data available for Tuya Volcanic Field. 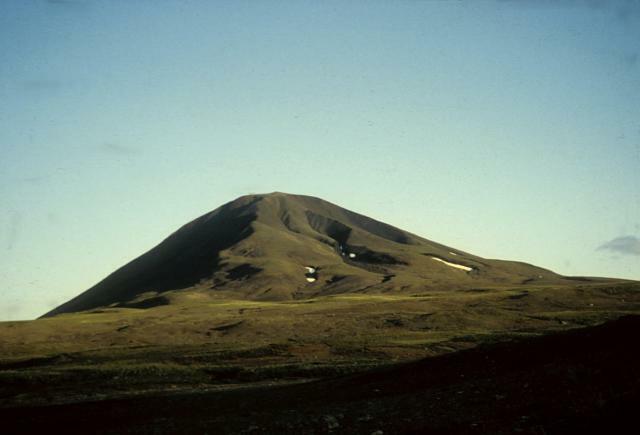 South Tuya, seen here from the north, is one of six subglacial volcanoes cluster close to Tuya Lake, in north-central British Columbia. The cone seen above comprises loose volcanic debris as well as dikes of basaltic rock intruded into the volcanic pile. The base of the volcano comprises pillow lavas and hyaloclastite, indicating that the volcano formed either beneath ice or with a large lake. Several small postglacial lapilli cones and lava flows have been reported in this area. Photo by Ben Edwards, 2003 (Dickinson College, Pennsylvania). There are no samples for Tuya Volcanic Field in the Smithsonian's NMNH Department of Mineral Sciences Rock and Ore collection. Large Eruptions of Tuya Volcanic Field Information about large Quaternary eruptions (VEI >= 4) is cataloged in the Large Magnitude Explosive Volcanic Eruptions (LaMEVE) database of the Volcano Global Risk Identification and Analysis Project (VOGRIPA).